PHILADELPHIA (CBS) - Vice President Joe Biden made his second visit to Philadelphia in as many weeks last night. He spoke to hundreds of people in town for the American gathering of the Greek Orthodox Church. There was a warm welcome for Vice President Biden in what he calls his second city. He spoke to clergy and lay people who are part of a faith he says he’s become familiar with through the years. 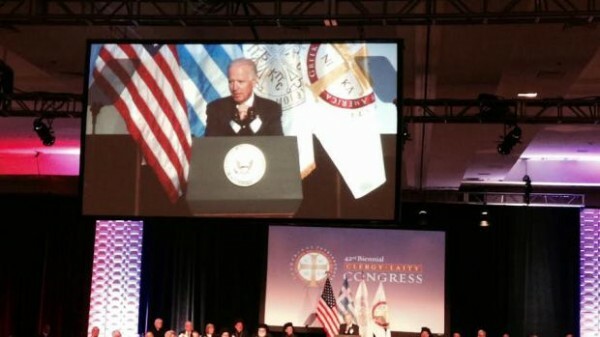 “One of my great honors to get to know the Greek Orthodox Church,” Biden said. His 40 minute speech focused on three themes. First, the relationship between the U.S. and Greece. Then, religious freedom, particularly in Turkey. “And the right of the Greek Orthodox Church to control its destiny free of the influence of any government,” Biden said. The Vice President also focused on Turkey’s occupation of Cyprus, and ended with a call for bipartisanship closer to home.